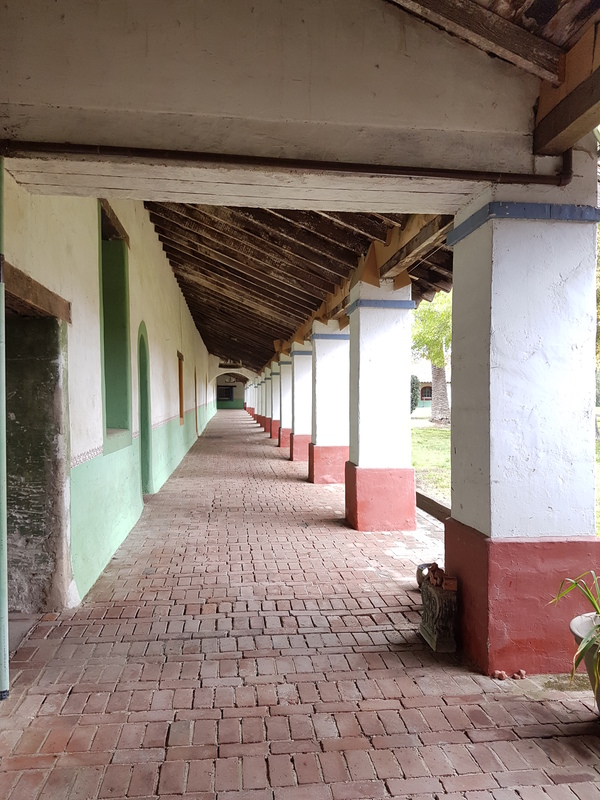 My vacation is long since over but I want share a few pictures from Mission San Miguel Arcangel, located in San Luis Obispo county in California. Just off the highway, this mission is in an agriculturally rich area. There must also be an army base nearby, based on uniformed personnel we saw eating at nearby Leo’s Cafe. 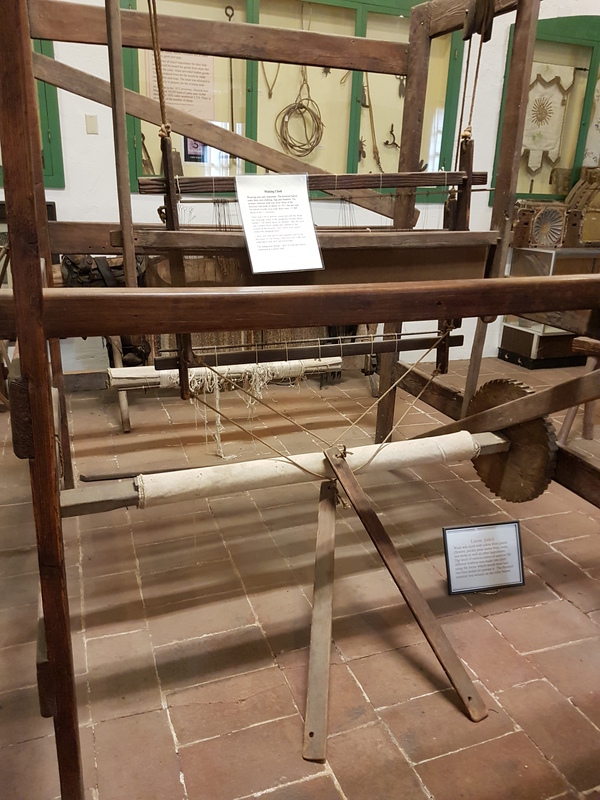 The loom below was part of a display of how the mission operated. Sadly it’s not in a usable state. My first attempt at rosepath didn’t yield the results I was expecting. The only thing to do was try again, this time with a series of four tea towels (dish towels) in mind. 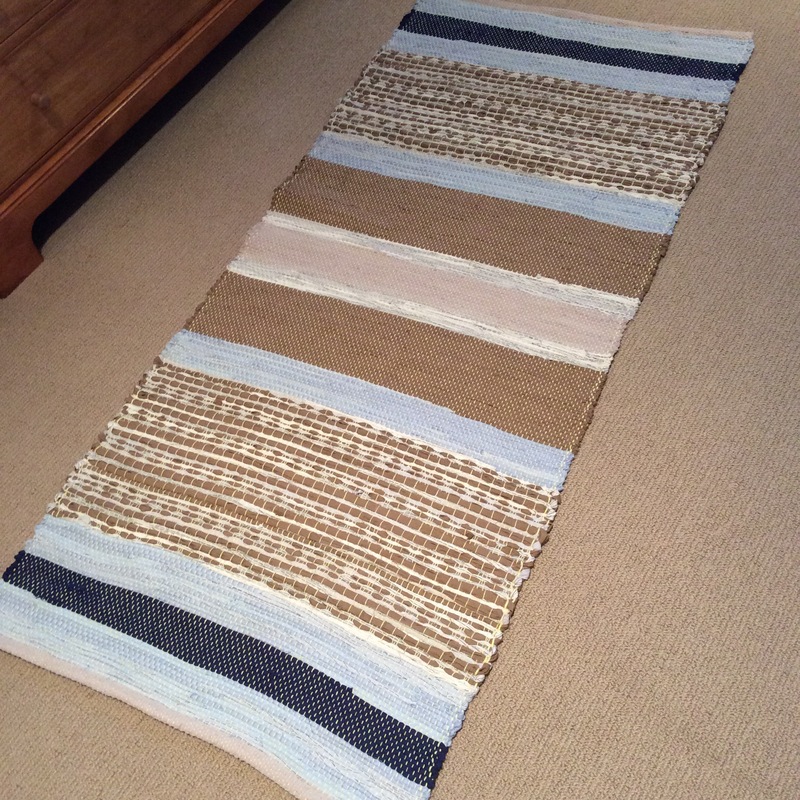 I am using 8/4 carpet warp cotton for the warp and weft. The borders are 8/2 cotton doubled. I chose to use 8/4 carpet warp after reading Tom Knisely’s baby blanket project description in Handwoven Magazine (Nov/Dec 2016) where he describes it as a yarn that is cost effective and one that softens with use and washing. 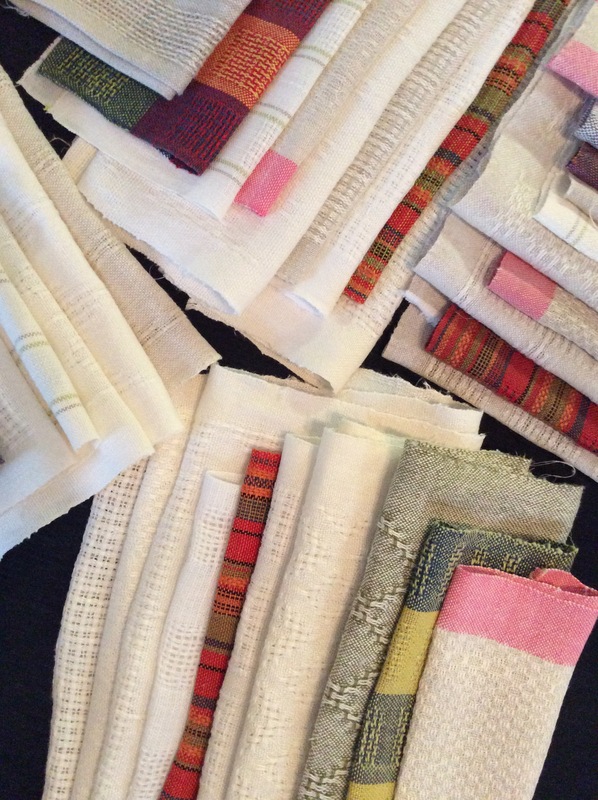 I used the 16 epi twill sett that is in the project notes and warped my loom using Osma Tod’s ‘authentic way of weaving rosepath’ draft, detailed in her wonderful book The Joy of Hand Weaving. Her drafts are written for a sinking shed loom and I was glad I noticed that before I started weaving on my jack loom. This project had brought different mistakes, new learnings and another first. I am using a boat shuttle for the first time, with paper pirns, wound using Tinkerer’s battery-operated drill. It’s an ugly solution but it seems to be effective. I bought a piece of 3mm brass rod to use as a spindle and am attaching the pirns to the spindle using a small piece of masking tape (painter’s tape.) I’m sure the purists will disapprove but it will do for now. One day I might have a fancy bobbin winder. 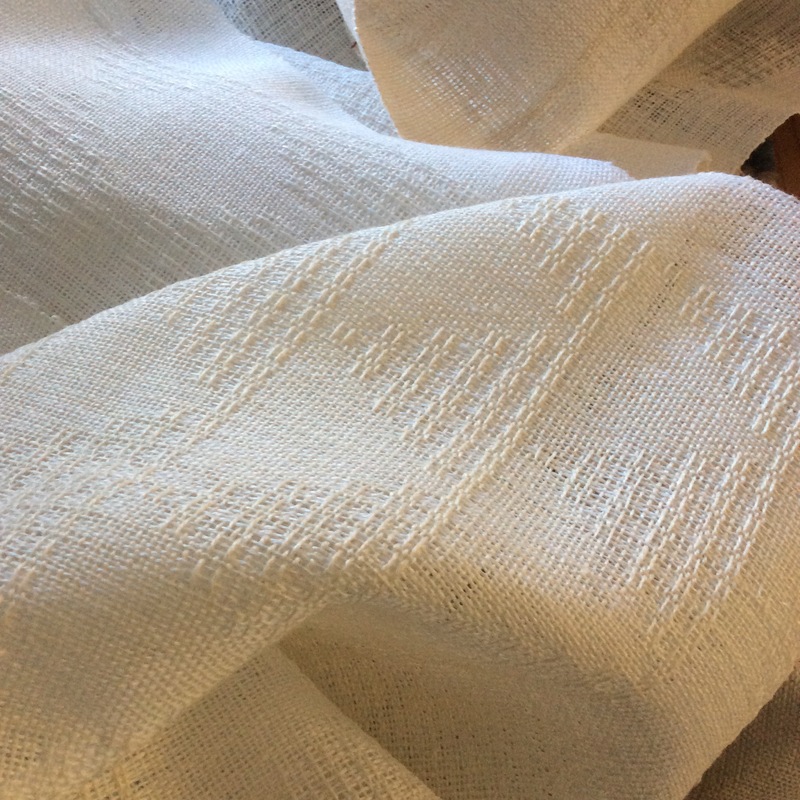 The weaving width is 18 inches in the reed and I am weaving each towel to a length of 30 inches under tension. The goal is that each towel will measure 17 by 28 inches after wet finishing and hemming but as I’m still weaving towel #3, I’ll have to get back to you on that one. By the way, the border element in the first towel pictured above has a mistake (one of many) that is visible if you zoom in on the photo. The second towel has no mistakes that I know of at this stage and the third seems to be coming along nicely.